The Look, Listen and Live series of 8 audio-visuals is excellent for systematic evangelism and Christian teaching. There are 24 pictures in each book. This series gives studies of Old Testament characters, the life of Jesus, and the young Church. It is particularly suited to bring the Gospel message and basic Christian teaching to oral communicators. The pictures are clear and brightly coloured to attract those who may not be used to visual teaching presentations. 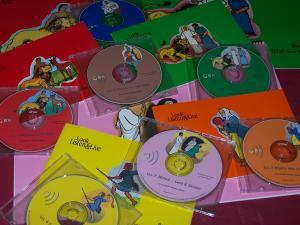 These are available in hundreds of languages, and are designed to be played along with the pictures. Playback may be paused from time to time to give opportunity for questions, discussion and further explanations as necessary. The recordings have been made, where possible, using mother tongue speakers with clear voices who are respected in the local community. Local music and songs are sometimes added between pictures. Various checking techniques are used to ensure the accuracy of translation and communication. These are A3 size (420mm x 300mm or 16.5" x 12") spiral bound at the top. They are suitable for large groups of people. These are A5 size (210mm x 140mm or 8.25" x 6") stapled. They are suitable for small group and individual use. These are A7 (cassette) size (110mm x 70mm or 4.25" x 3"). They are ideal for giveaways and individual use. Both colour and black & white versions are available. These are available online in simple English. The scripts are a basic guideline for translation and recording in other languages. They should be adapted to suit the language, culture and thought patterns of the people. Some terms and concepts used may need a fuller explanation or even be omitted in different cultures. Appropriate local stories and applications may be added to the scripts to better illustrate the basic teaching of each picture-story. These carry bags can be used to hold a set of 8 flipcharts and associated scripts, CDs and/or cassettes. These CDs contain all the pictures from the "Look, Listen & Live" as well as the "Good News" and "The Living Christ" picture series. The images are in high resolution black & white TIFF files for printing (up to A4 size at 300 DPI), and medium resolution colour JPEG files for computer display (at 900x600 pixels) or printing (up to A7 size at 300 DPI). Scripts and other resources are also on the CD.